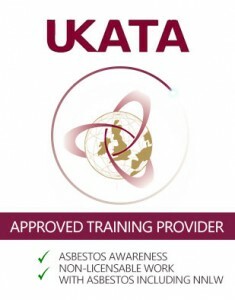 A member of UKATA, Boss Training offers four distinct Asbestos Training courses. While our UKATA Asbestos Awareness Training is sufficient for those who could potentially come into contact with asbestos, those who undertake short duration work with non-friable materials must complete the Non-Licensed Asbestos Removal Course, also known as Category B Asbestos Training. What is a non-friable material? Materials containing Asbestos can be divided into two types or categories – friable and non-friable. Friability is the likelihood of an asbestos containing material releasing asbestos fibres when disturbed. Friable asbestos can easily be reduced to powder by hand when dry, and so it poses considerable risk to health when disturbed. To remove this type of material, you need a licence and specialist training. Non-friable material, although containing asbestos, refers to materials where the asbestos is firmly bonded, meaning that (with the right training) it can be removed without turning to powder and presenting a risk to workers and public health. The latter is the type of material you can remove once you have completed our Non-Licensed Asbestos Removal course. Who needs Asbestos Removal Training? Although the dangers of asbestos are now well known and the material is no longer used in construction, it can still be found in older properties, so anyone who could potentially come into contact with asbestos should complete an Asbestos Awareness Course. However, anyone who undertakes work on non-friable asbestos containing materials should attend Non-licensed Asbestos Removal Training. This work includes drilling into textured coatings, removing insulating board and lifting floor tiles. For more information on non-licensed asbestos work, click here. Please note that you MUST have completed an Asbestos Awareness Training Course in the last six months to be able to take the Non-Licensed Removal Training. When can I do the Asbestos Removal Course? Boss Training offers UKATA registered Non-licensed Asbestos Removal Training on or off site. We run the course every month at selected training centres or we can deliver it onsite nationwide for groups of up to 6 delegates, depending on previous experience and knowledge. Before the training session, we will conduct a training needs assessment to establish the types of asbestos containing materials (ACMs) that are likely to be encountered, as well as the work that is to be undertaken. Our training product is not ‘set in stone’. We can tailor it to the specific type of work and material likely to be removed, and we can also offer advice on related activities, such as choosing a licensed asbestos removal contractor, air testing, and asbestos surveys. What Does the Non-Licensed Asbestos Removal Course Involve? The content of your UKATA Non-Licensed Asbestos Removal Training will depend on whether or not you have completed an Asbestos Awareness Course within the last 6 months. If you have no previous asbestos awareness training, the course duration is 1.5 days (or 9 hours) and covers awareness as well as non-licensed removal. If you have previous asbestos awareness training and this was completed within the last 6 months, the removal course duration is 1 day. We will need to see evidence of your awareness qualification prior to the course start date. Training is delivered using a mixture of lecture, theory assessment and practical training methods. On completion, successful candidates will receive the UKATA registered non-licensed asbestos removal training certificate and a licence photo card which is valid for 1 year. After this a refresher course is recommended. Boss Training currently provides asbestos training courses across the UK. Contact us today by submitting our quick contact form, sending us an email at enquiries@bosstraining.co.uk or calling us on 01422 358 184 to book your training course or discuss your businesses requirements for a bespoke training programme. My guys recently attended the Boss Asbestos Awareness & Removal course, Venue: Brighouse. The following day they had to sit an insurance Training module to confirm understanding of the course. Not only did they Pass – They passed at 100%! Well done guys and well done Boss Training for getting the very important message over so well.